Before starting this unit, I'd checked into the possibility of purchasing molds and deckles from papermaking supply companies, but there wasn't time to order--this unit jumped to life when I found out that I would be teaching a mixed grade course (5th through 12th!) 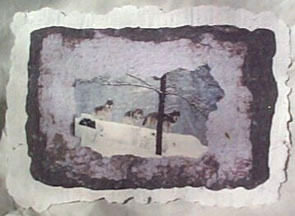 during January 2000 on "Papercraft." Based on the suggestion of another teacher, I purchased stretcher frames, very inexpensively, at a local art shop, and nylon screen from a hardware store. Using U-shaped brads, we tacked the screen to the frames to make a taut surface. Having never tried this before, I invested in a book called Arnold Grummer's Complete Guide to Easy Papermaking. I found it to be very helpful and it's one I would recommend to anyone who's new to this artform. There is a lot of history and science about paper in the book, and part of our unit involved the students being able to answer questions along these lines. 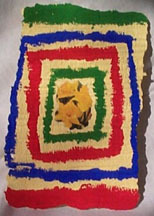 There are also interesting projects to try using basic papermaking techniques. We tried some, adapted others, and came up with many ideas on our own. To start, we filled the blender about 3/4 full with water (cold water was all we had, so cold was all we used. I don't know if warm or hot water would work better). We then added shredded up paper--sometimes mixing white copier paper with construction paper. I can't be specific about the amount of paper to add--roughly about the equivalent of a sheet and a half, perhaps--enough to get a consistency of a thin "milkshake" and not enough at one time to bog down the blender. While many papermaking methods suggest pouring this mixture into a dishpan and dragging the mold and deckle through it, we decided we didn't like this approach. Instead, we propped the screen(s) on top of the dishpan, and poured directly from the blender onto the screen. And while we sometimes used both screens on top of each other to form a border and "container" for the paper pulp, more often than not we simply used a small piece of matboard to drag the pulp in from the edges of the screen. Once the excess water had drained through into the dishpan, we would place the other screen on top of the first (sandwiching the pulp in between the layers), move the whole business to some waiting newspapers and towels, and start sponging off more water. Further experimentation led us to try embedding photographs from magazines and newspapers. To do this, we poured the pulp onto the screen, let the water drain through, placed the photograph in the center, and pulled a little bit of the pulp over the edges of the picture to keep it in place. We then proceeded as "normal," regarding further drying and pressing. We embedded leaves, flowers, and other flat objects in a similar way. At some point, we started using different colors of pulp poured onto the same screen to form borders and designs in the paper. This also worked well, though it was important to use pulps that were of like textures in order to achieve a sheet of paper of uniform thickness. We poured the water from the dishpans into clean, empty gallon milk containers. Any remaining pulp would settle to the bottom over night, and the clear liquid at the top could safely be poured down the drain. Regarding safety, however, younger children should always be supervised when using the blender. I usually had an older student stay with the 5th graders as they were grinding up their paper into pulp. So while our methods weren't exactly conventional, we were very pleased with our results! Click on the image for more information about our resource book!